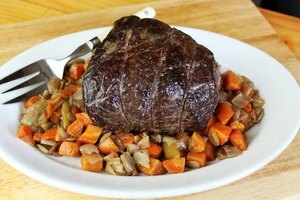 A outside round roast, also known as a bottom round roast, is a cut of beef from the hip part of the cow. The cut contains connective tissues and can have a chewy texture if cooked improperly. 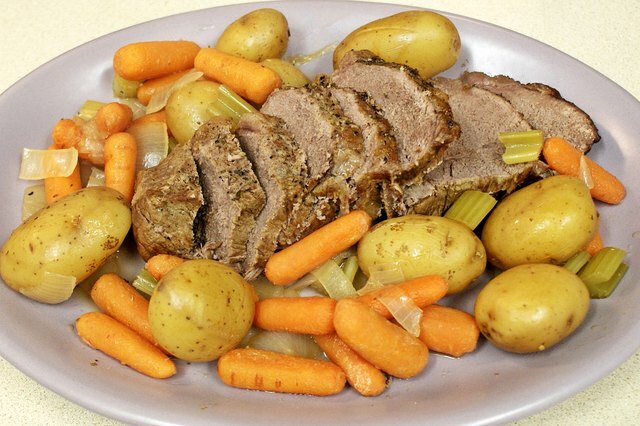 You don't want to overcook your outside round roast, and you don't want to cut the meat into thick slices. The key to a tender outside round roast is cooking it slowly and making sure you have plenty of liquid in the pot you use. Like with other meats, you will need to do some preparation and marinating before placing the outside round roast in the oven. 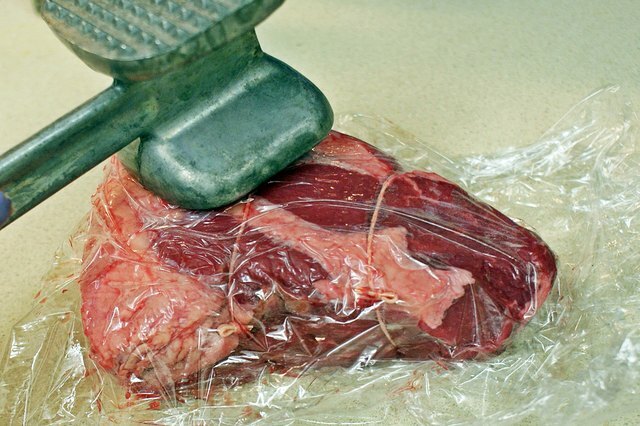 Make sure you pound the roast with a heavy object, such as a meat mallet or other clean object. 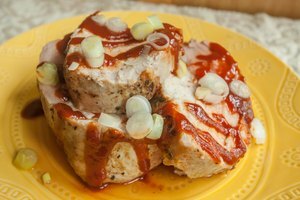 Pounding breaks down any connective tissue in the outside round roast. Use a commercial marinade to make the roast even more tender. But note that some marinades contain salt and other seasonings. So be careful not to add additional salt and seasonings to your roast if you use a marinade. The best approach to cooking this type of roast is to cook it in a stock pot with plenty of liquid and vegetables such as onions and celery. You want the meat to be juicy, and the only way to ensure that is by keeping a watch on how much beef stock, wine, soup or other liquid is present in the stock pot. Before placing the prepared meat in the pot, brown the meat in a skillet or pot on all sides for about 10 minutes total. 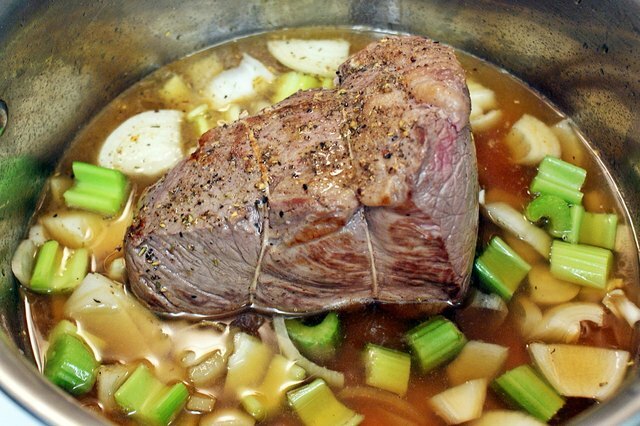 Make sure your oven is preheated to 300 degrees F. Cover the meat about halfway up with a liquid like beef broth, soup, wine, water or a combination of liquids. Don't forget to cover the pot with a lid. Bring the pot containing the roast, liquid and vegetables to a simmer on medium heat before placing it in the oven. Outside round roasts need to cook for about four hours. Make sure you check the amount of liquid in the pot and turn the roast every 35 minutes so it can cook on all sides and receive the liquid properly. To test your roast for tenderness, stick a fork in it. The fork should move in and out of the outside round roast easily after about three and a half hours. Add sliced carrots and small potatoes to the roast during the last 40 minutes of the cooking time. 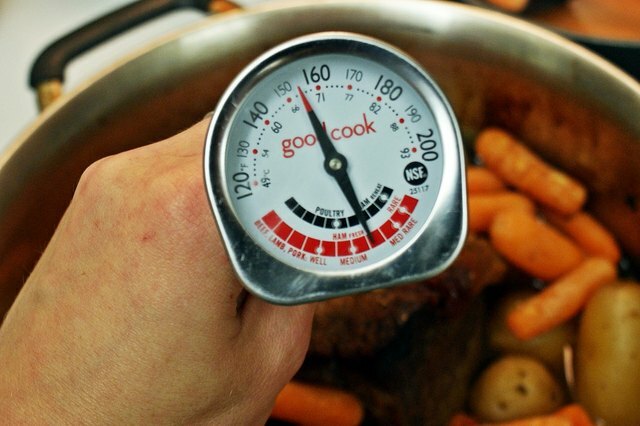 The best way to tell if the meat is done is by inserting a meat thermometer into the thickest part of the outside round roast. 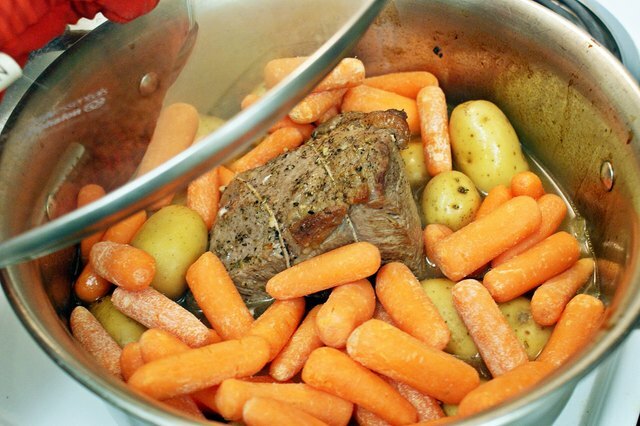 The internal temperature should be about 160 degrees F. Also, you don't want to overcook the roast, so remove it from the oven when the thermometer reads 5 to 10 degrees below 160 degrees F. Once the outside round roast is done, transfer the meat to your serving dish and tent with some aluminum foil. Let your roast stand for about 20 minutes before cutting and serving. 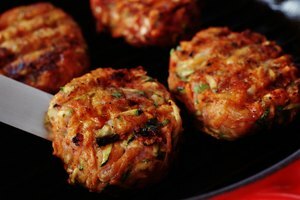 You may want to use the juices from the outside round roast to make a sauce by skimming off any fat and boiling the liquid for about five minutes.